Animals with Attitude March 1 – April 7, 2018 The Arts Center Gallery Free and open to the public From the pre-historic cave paintings in Lascaux Cave, France, to Franz Marc’s Large Blue Horses, countless artists have used animals as their subject matter. Sometimes the artist’s aim is representational—to capture the animal’s every detail in photographic reality, whereas other artists seek to capture the animal’s essence, through unique color, exaggerated perspective and context. It is this second group of artists, those who leave the conventions of reality behind, whose work comes alive in the exhibition, Animals with Attitude. Over the past few months, we’ve seen many animals in the gallery: Richard Martinson’s folksy horses, cows, and birds and Brad Bohl’s highly realistic wildlife paintings. In contrast, and drawing on the work of various artists, this mixed media exhibition features the work of artists who believe dogs can be blue and horses can be purple. They have captured each animal’s personality whether the subject is a beloved pet or wild bird. Two of The Arts Center’s resident artists have work in the exhibition, you’ll see Laura Ruprecht’s mosaic birds and handmade tiles and Linda Roesch’s expressively painted dogs. Drawing from private collections, there will be the work of Deborah Mae Broad whose animal etchings provide a window into an animal’s soul, while Doug Boyd’s humorous and quirky mixed media work will make you laugh. 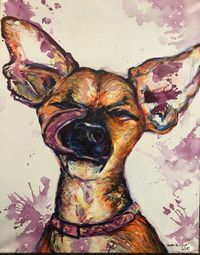 Emily Williams-Wheeler and Karen Bakke’s paintings are bold and colorful, Bakke capturing the small details in various animal’s eyes and Wheeler’s the energetic interaction between animals. Meet the Artist Luncheon An Animal Inspired Lunch with Laura Ruprecht Friday, March 16, 2018 from 12:00 – 1:00 pm Enjoy a homemade lunch for $5 or bring your own. Please RSVP by March 14 if you do want lunch. This exhibition should make you smile—a perfect show, not only for the sophisticated art lover, but anyone who loves animals—a visit to the gallery would be a perfect outing for the entire family.